Tasty This Asparagus Frittata turned out delicious made in a springform pan. The frittata turns out nice and firm and it doesn’t brown on the top or bottom like you would get from frying. This is a great breakfast, brunch or dinner recipe. Of course you can combine many different vegetables to make your own delicious frittata. This one was simply made with asparagus, cherry tomatoes, sweet bell peppers, onions and potatoes. 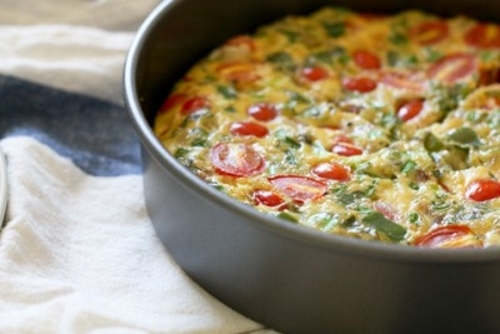 This Asparagus Frittata can be served with a light salad on the side. The way I like it is between two slices of warm Italian bread. Enjoy! Stir in the asparagus, onions, peppers and potatoes. Cover and cook stirring on occasion until the vegetables are tender and the potatoes are slightly browned. In a large bowl whish together the eggs, milk and cheese. Spray the springform pan with the cooking spray and cover the bottom with aluminum foil. Place the pan on a cookie tray. Add the vegetable mixture to the springform pan. Stir in the egg mixture and bake for approximately 40 minutes until the center is firm. When finished run a knife around the edge of the pan and release the sides.